Where Were You in '64? 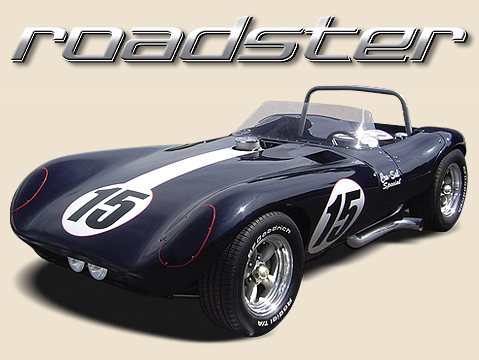 If you were lucky enough to be at RoadAmerica's June sprints, you saw the only version of the Cheetah ever produced in a Roadster version handily win - and it did the same thing the next year, too. This, of course, was the legendary Cro-Sal Special, named for Gene Crowe, the car's mechanic and Ralph Salyer, owner and driver. The roadster's roots? Cockpit heat. To overcome it, Crowe - along with a couple of other modifications - cut the coupe's top off, creating the only Cheetah Roadster ever. As one racing historian noted, "That also solved the problem of unequal air pressure within the cockpit, which showed itself early in 1964 at Daytona when the doors and hood blew off the car . . . at over 200 mph." Inspiration has to come from somewhere. The Cheetah's history is incredible . . . the Roadster version was born of necessity and ingenuity, too. Manufactured by BTM LLC of Arizona.